At KCEconomy we often compare the Kansas City region to our peer metro areas, and generally we like to be on top. 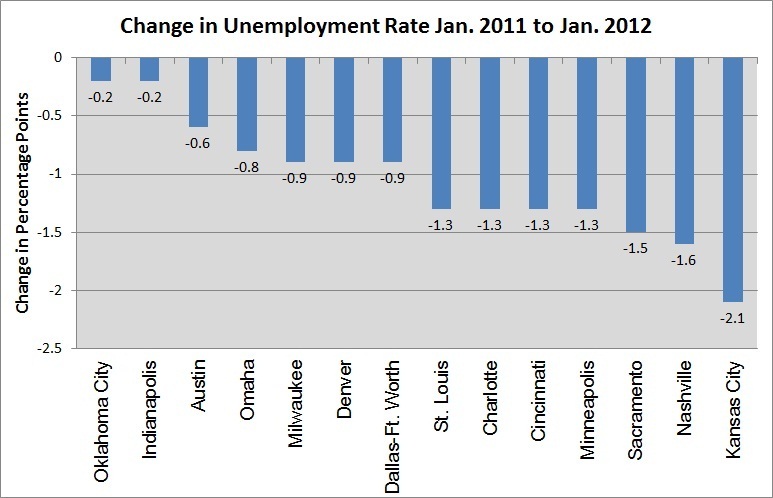 In the case of annual unemployment rate change, however, the lowest number is exactly where we want to be. 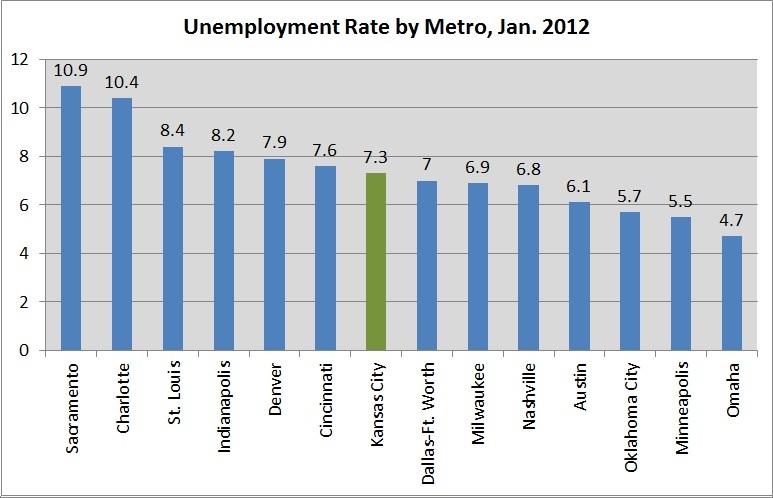 New data shows that Kansas City had the largest drop in unemployment rates among our peer metros between January 2011 and January 2012. Over the past year, our unemployment rate dropped 2.1 percentage points and now stands at 7.3 percent. Not only did we outperform our peers in this area, but our unemployment rate had the greatest drop of all large metros in the country! For some time, we have puzzled over the sluggish performance of the region’s labor market. As the nation has started to recover jobs, we seemed to lag. Data from late 2011 showed that local employment activity might have started to pick up steam, and today’s data suggests that Kansas City has really begun to make up for lost time. While our unemployment rate is dropping faster than other metros, as indicated in the chart above, we still have room for improvement. The chart below shows that our current rate is still higher than many of our peers. That’s another statistic where we aspire to be on the bottom – with the lowest number, that is.